Home » calvert deforest , comedy , david letterman , deaths , larry bud melman » "I love you for loving me! Goodbye!" "I love you for loving me! Goodbye!" 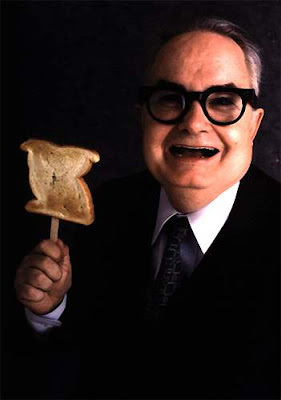 You might have heard the sad news already: it was reported last night that Calvert DeForest... who will forever be known as that lovable oddball Larry "Bud" Melman on the original Late Night with David Letterman (NBC wouldn't let him keep the Melman name when the show moved to CBS)... has died at the age of 85. Whether he was Larry Melman on the NBC show or Calvert DeForest at CBS, he was definitely a unique and memorable personality. Usually he'd be put in some weird situation as a Late Night/Late Show correspondent (remember him doing the 1994 Winter Olympics in Norway?) and proceed to act confused and flub lines... usually with the cue cards right in front of him too. Melman was on the very first edition of Late Night that I saw (it was like 1986, four years after Letterman started his show at NBC). I watched him quite a few times over the years at NBC and then when the show moved to CBS. He did a lot of hilarious stuff. But the one thing that I'll always remember Calvert DeForest for was his very last appearance using the Larry "Bud" Melman name, on the final Late Night show on NBC in June 1993: Melman strode out onto the stage. He then yelled at the top of his lungs "I love you for loving me! Goodbye!" and then walked off. The next time we saw him he was Calvert DeForest in a tuxedo standing in the pupil of the CBS eye a few months later when Letterman's Late Show premiered: "This is CBS!" he bellowed.